The professionalization of sports changed the math for millions of young African-Americans, both male and female, providing careers, scholarships and a pathway to fame and further fortune. Now esports is quickly rising to become the next iteration of big-stakes competitive play. Boasting a digital-first, broadly global audience, the esports marketplace raked in $696 million in 2017, with projected revenues to exceed $1 billion by 2020. But within the esports juggernaut, there is a pronounced and growing racial gap in the player pools. African-American representation on the major teams and in the highest-profile events is abysmal. There are high-profile players of color, such as Zaqueri “Aphromoo” Black and Dominique “SonicFox” McLean, but why are there so few other black players making it to the top of the various leagues? The answer may lie in the foundations of esports — the actual video games many of us played growing up. PC games, such as Dota, League of Legends, StarCraft and Counter-Strike, grew into their own ecosystems. Over time, spectators gathered, communities grew and funding started to flow. But for console games such as Call of Duty, Super Smash Bros., Halo and Street Fighter, the communities grew but the same funding and opportunities didn’t materialize. 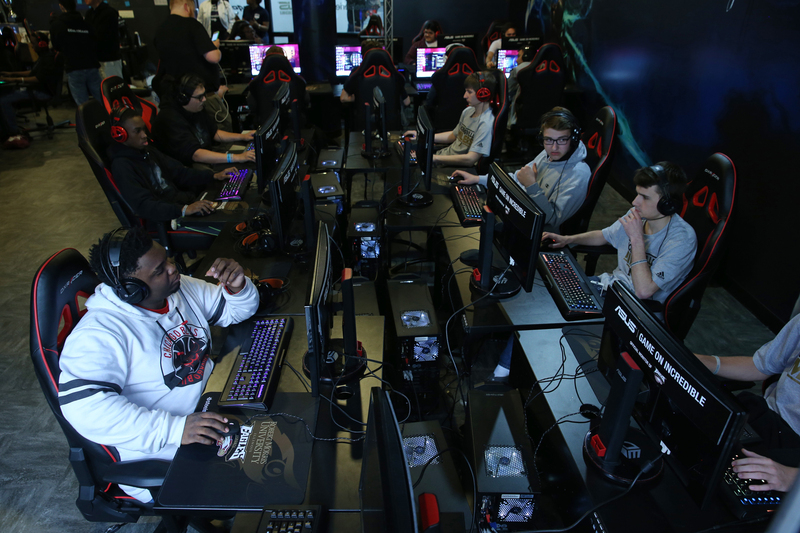 As esports matures, one thing has become crystal clear: The PC/console divide has inadvertently become a racial divide, with white and Asian players featured most heavily on the PC side and African-American and Latino players on the other. This divide isn’t sacrosanct — clearly there are black and Latino players who have found their home in PC-based esports and white and Asian players who prefer joysticks to mouse clicks. But the prevalence of the divide should give any fan of esports pause. As we create this new world, what exactly are we building? With the levels of investment pouring into esports and the rise of an entirely new field of play, it’s important to ask deeper questions about these dynamics before they codify. Especially if those dynamics have deeper racial implications. 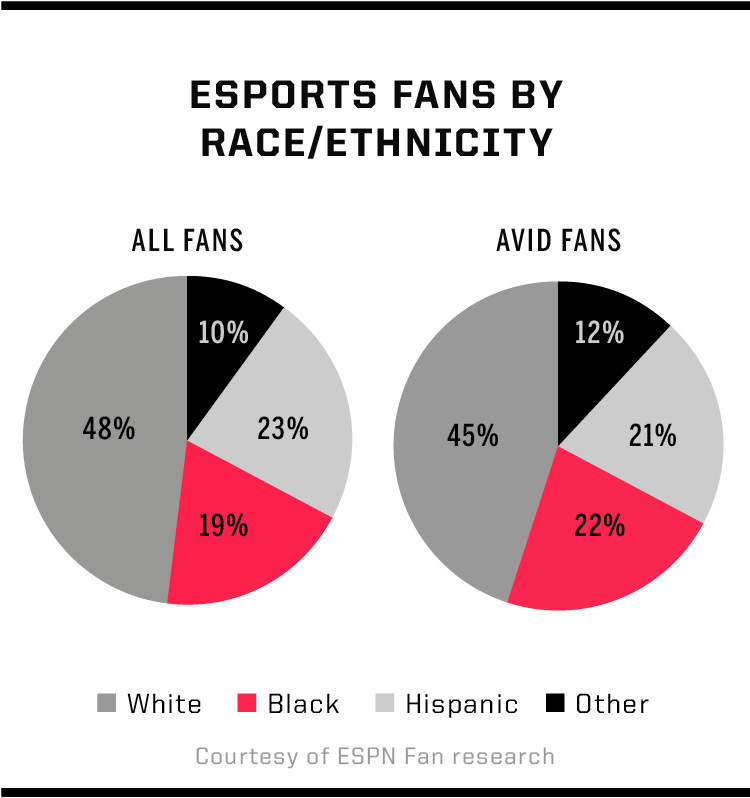 If esports fans are fairly evenly distributed by racial lines (at least in the United States, and assuming that the “other” category includes Asian-Americans), why are we still seeing such a disparity in who goes pro? Preferences around hardware is one potential cause since it influences the ways a player chooses to pursue a career. A study of play practices suggests young African-American men play in specific ways that differ from the groups who do tend to leverage gaming interests in to computing interests . DiSalvo’s research is trailblazing in many ways and can be applied to a variety of findings in computer science programs. And while her initial findings do have interesting implications for competitive gaming, they don’t apply specifically to esports, which rose to prominence after her research began. Most research on esports currently focuses on defining the field or considerations in gambling and legal rights — race is not a primary consideration. And even if African-American players currently prefer consoles (a preference also shared by other esports fans), there are a few reasons that the PC ecosystem around esports is more robust than a console/arcade background. From a technological standpoint, there are issues with console latency — many professional players also prefer the higher frame rates (the number of frames or images that are projected or displayed per second) possible with PC play and do not consider themselves competitive unless their gear is up to the highest standards. On the console side of the aisle, the release of a new console every five to eight years means that decades of practice can be undone by the release of a new controller. But there’s also the financial aspect to the PC/console divide that contributes to a growing disparity in esports: the sheer dollar amounts involved. For PC-dominant games such as Dota and League of Legends, the prize pools involved reach into the millions. Part of the money is normally fronted by the publisher to seed initial interest. But much of the pool can also come from competitor or fan contributions. And while there is a major pot for PC-based prize pools, in the console-based world the top prize pools barely reach the hundreds of thousands. While the historic take in the Dota 2 International prize pool came from community support, the publisher threw in $1.6 million to start. Console publishers have historically been more reluctant to invest big in prize pools or to even support the grass-roots communities around their games. All of these individual decisions by publishers are currently examined in the context of just one game. But if we broaden the lens to the full landscape for esports, the scope of the problem is clear. Currently, if a player loves Dota, there’s a sponsored path toward a career in the industry and the potential to net up to $10 million in the current prize pool. It can become a lucrative career if a player can reach the highest levels. But if a player loves and puts his or her hours in on Street Fighter, at best, the highest individual take would be $50,000. These dramatically different outcomes based on the games you love sets up a pernicious cycle in esports — the players who were drawn to more lucrative games have the chance to continue to compete and to live off their earnings. Players who love games that do not find publisher support and audience support simply will not have the same opportunities for advancement in esports, regardless of how good they are. There is an argument to be made that esports players who want to go pro should go where the money and support are. While that is antithetical to the love of the game that has taken esports this far, the changing landscape may require examining opportunities within the game. But even if one were to push young black players into the more lucrative PC-side gaming, would they be welcome? Every few months, there’s been a new discussion of racism in the esports community. There is the long-standing issue of racial slurs as a part of overall toxicity in online gaming communities, which has already claimed the careers of a few pros. There’s the tongue-in-cheek-but-not-really adoption of the “PC Master Race” framework, which becomes more disturbing when you compare the broader demographics of PC gamers and the so-called “console peasants.” There are the dust-ups over the use of Pepe imagery by professional players and the racist applications of the TriHard emote. And then, there’s what happened to Terrence “TerrenceM” Miller in 2016 while he was playing Hearthstone. Miller was playing for Gale Force esports and doing his best to compete against Keaton “Chakki” Gill. While he finished a respectable second place, his performance was marred by the Twitch stream, which was flooded with racial slurs. As most African-American gamers will attest, racism on streams and through chat is nothing new. But the vitriol was so bad it shocked the community and led at least one moderator to speak out against bad moderation practices. This story could have been seen as triumph — after all, Miller played well despite the abuse and prompted both Twitch and Blizzard to address the controversy. But the story has an unfortunate postscript: After rising to prominence for the incident and finishing second, Miller is currently unsigned and has a pinned tweet saying he is looking for a team to represent in the 2018 Hearthstone season. On March 22, Miller retweeted a ranking where he was listed as one of the top unsigned players. From the prevalence of these types of stories, one might conclude that esports is an environment where only the thickest-skinned people of color can flourish. But that’s where the fighting games community (FGC) comes in. “The thing that has carried over the most [from arcades to the current FGC], and it was probably the most important thing about the arcade, is that it was face-to-face,” Cannon says. “And of course that’s carried over, because no one’s figured out how to make online fighting games really competitive because of the latency. I mean they’re good, they’re a lot better than they used to be, but [they’re] still not up to the standards where you can really play a serious game at the highest level of competitive play. Not in the same way that you can in StarCraft, or even FPS games. Many arcade players were able to practice and play outside of arcades when they started disappearing, thanks to arcade controllers. But even with the strong fan base and strong franchises, the FGC is more financially precarious than any other side of esports. If esports are seen as a career path, the fact that the average FGC player will make less than half of the lifetime earnings of another player because of the game he or she loves should give every fan of esports pause. If we are trying to recruit the best and brightest, should there be a console tax? But even games that are released on console participation and have diverse player bases are still seeing these dynamics reassert themselves when the league professionalizes. While the Overwatch League was embroiled in discussions about gender and their first female pro player, Kim “Geguri” Se-yeon, the racial makeup of the team rosters largely escaped comment. And only a few have questioned why there isn’t an Overwatch console league. An interesting test of the burgeoning esports ecosystem will be the first NBA2K draft on April 4. Leaving aside the conversation about whether sports brand extensions such as Madden, FIFA and NBA2K will become noteworthy esports like the more established games, already there are some key differences. One, NBA2K already has such a broad player base that a non-diverse roster would defy logic. As it stands, the top draft pick for NBA2K’s first season is an African-American player who goes by “Dimez” online. From a career perspective, the draft provides a stable salary, anywhere from $32,000 to $35,000 for a six-month contract. That’s more than the players in the NBA’s G League make. And while it is too soon to determine whether NBA2K will find the same kind of audiences as Dota and League of Legends, the close tie to more traditional sports creates a completely different career path into the NBA. It is also worth mentioning the 2K league qualifiers were console-based — according to the callout, the draft was open to any player with an Xbox 360 or PS4. It’s too early to tell whether the shift will lead to a more racially diverse league, but the early indicators are hopeful. The issue of PC vs. console play in esports is less about simply calling out visual markers of diversity and more about examining the dynamics of a blossoming system. Just like there are unintended consequences to decisions such as restricting a pro-level league to PC play only, there are other decisions that could alter the emerging landscape — and it isn’t clear whether every decision will be better or worse for the industry. Back when esports was mostly a network of grass-roots scenes, we could convincingly argue that each scene was organic, and the players being pushed through the scene were simply the best currently playing. But as investor money starts flooding the zone and esports begins to adopt a variety of professional structures such as players’ associations, it is important to ask if esports is an equal playing field for all. And, if for some reason it isn’t, there is still time to change course. Esports is new — it doesn’t have to turn a current disparity into a reality.